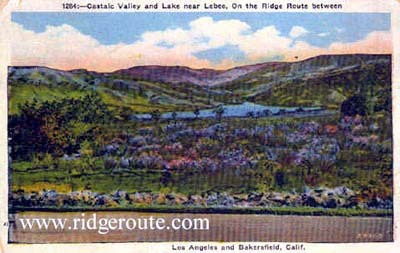 Not to be confused with Castaic Lake farther south in the community of Castaic. Located due east of Lebec. According to local legend this lake was once the scene of a wholesale massacre. A cook and a boy had been murdered at Fort Tejon. A local tribe of Indians fell undersuspicion and the exasperated white men drove the entire village into thelake. Their bodies were mummified by the mineral salts in the water and were said to have surfaced at intervals for a long time thereafter. The Tejon Ranch Company refers to the Lake as Tejon Lake today.